Vintage Mens Cable knit sweaters aren’t quite the old fashioned knitwear items they used to be. It’s increasingly worn by fashion conscious individuals as a viable piece of fashion wear that can be mixed and matched with everything. No more old cable knit jumpers worn by grannies and matched with a nice pleated skirt. Vintage Cable knit seaters and cardigans can be worn with skinny jeans, shorts and maxi skirts, and a cable knit cardigan is a dream to wear with leggings or a denim mini. Oversized is often better and in terms of vintage, a cable knit cardigan or sweater is always going to be one step ahead of today’s mass produced knitwear. You’re guaranteed an original item and a wardrobe staple that you can pull out of the closet and wear anytime, anywhere. If it’s made from good quality wool, and the older they are this it’s usually the case, then you have a garment that will last as long as you want it to. A good quality item that’s versatile and very wearable. 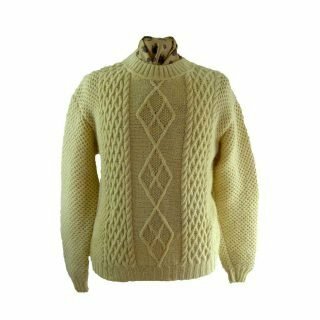 Take a look at our range of vintage Mens cable knit cardigans, sweaters and tank-tops and find yourself a new piece of knitwear today.